It’s like déjà-vu. I know I’ve been here before. 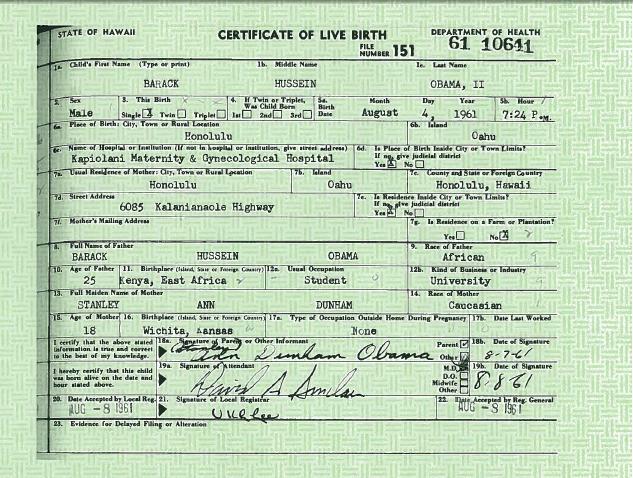 The Obama administration releases yet another birth certificate to squelch those darn “birther” rumors. 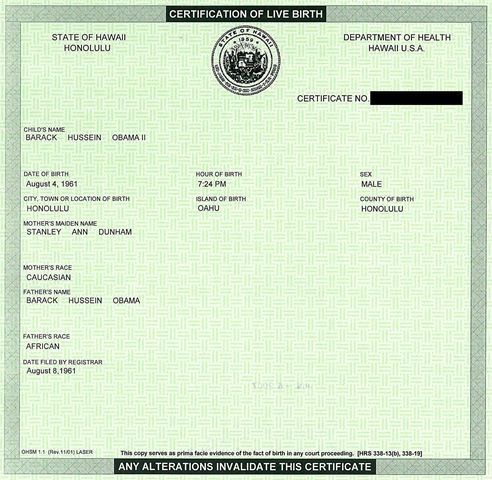 When I first heard the Obama camp released his real birth certificate my first reaction was ”Well obviously this has to be fake.” But for a split second I gave Obama the benefit of a doubt. I thought “Maybe this could be the real thing”. But alas my first reaction was right. Just one look at that form and I knew it was yet another sorry attempt to put to rest his citizenship issue. In actuality this is going to hurt Obama and cause more controversy. How you may ask? Well first the document that is being presented states it is a “Certificate of Live Birth”. We must understand that a “Certificate of Live Birth” is NOT a birth certificate. It wouldn’t even pass in a court of law as proof of birth. So therefore the first thing wrong with this document is that it’s not even a birth certificate to begin with. Even with that aside we have to now deal with the OTHER “Certificate of Live Birth” Obama released a couple of years ago. That’s right, there is another one! In another attempt to squelch the rumors a “Certificate of Live Birth” was put on his own website. This was also proven to be fake. If it hadn’t there would have been no need to release another one. Let’s compare shall we? First we have “Certificate of Live Birth” number one from a couple of years ago posted on his website. Second we have the new one posted today. Notice the difference? You should. They’re COMPLETELY DIFFERENT! Not to mention the fact that for 50 year old documents they’re in amazing condition. I’m only 26 and my birth certificate looks more worn than these. So which ones the real one? Why is there two? Maybe one for each hospital he was supposedly born in. So you can see how posting this new document isn’t going to end the rumors. It hasn’t nailed the coffin shut by a long shot. 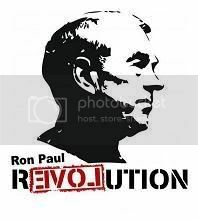 This is only going to create more buzz. New video shows document forgery!